Angled chimneys & sloped flues: this article explains the hazards of angled or sloped masonry or metal chimneys and chimney flues. Discussion includes code & safety issues with angled chimney flues - proper cutting of clay flue tiles for an angled flue; maximum angle for sloping chimney flues. These articles on chimneys and chimney safety provide detailed suggestions describing how to perform a thorough visual inspection of chimneys for safety and other defects. Chimney inspection methods and chimney repair methods are also discussed. This article series describes chimney defects and hazards that can be observed from on-roof access, including damage to a masonry chimney top, antennas mounted on chimneys, and angled chimney flue hazards. Our photo at page top shows a chimney that was angled severely beginning at the attic floor - look there for cracks that may have opened, forming a fire and gas hazard. 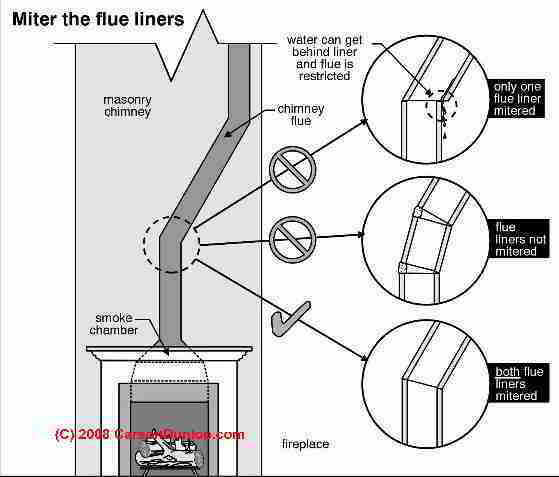 Offset or angled chimney flues are found in both masonry and metal chimney installations. Especially where multiple flues are routed inside of a single large masonry chimney or inside of a single wood-framed chimney chase, it should not be a surprise to discover that one or more of the appliances venting into one or more of the flues has to send its gases up at an angle to reach the final vertical section of flue in the chimney. Large masonry chimney with two or more internal flues, serving one or more fireplaces. Large chimney chases serving two or more metal flues with one or more fireplaces installed in the building. Just as we reported that a clay tile lined chimney would be difficult to clean due to projecting concrete between vertically-stacked clay chimney tiles, clay tiles need to be cut properly when constructing an angled chimney such as the one shown in Carson Dunlop Associates [at REVIEWERS] sketch. The sketches shown at left shows the concern with proper miter joints in a sloping masonry chimney flue. Only the bottom design, showing that the clay chimney tile was cut on an angle, is correct. The top two designs risk both cleaning difficulties and also water, smoke, soot,or creosote leaks into the chimney structure. The next Carson Dunlop sketch at left shows that a masonry flue is limited to 30 deg. offset, or in some jurisdictions, 45 degrees of offset while a metal flue may, in some areas, be permitted to slope to 60 degrees of offset. Metal chimney flues also cannot be sloped too gently nor for too great a distance or draft and clogging problems occur. A metal chimney might be permitted to run at angle of up to 60 deg. of slope in some jurisdictions. See TRIPLE-WALL METAL FIREPLACE CHIMNEYS for additional sketches and details about angled or sloping metal chimneys and flues and for a fireplace metal chimney inspection checklist. If elbows are used in the chimney the slope cannot be less than 30 degrees, and the sloping segment of the chimney above each elbow must be supported by straps or other means specified by the chimney manufacturer. Question: can I slope the oil fired furnace flue pipe at 45 degrees? What about 30 degrees? I have an attached garage that I want to put a oil fired furnace in. I am curious if I’m allowed to put flue pipe at a 45 degree angle in attic space to get horizontal distance from house to the required 10 feet. 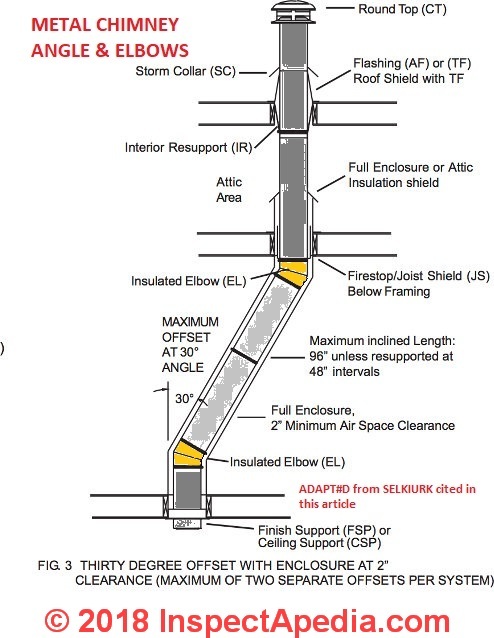 Illustration of a 30 degree chimney angle installation for an insulated metal chimney, adapted from Selkirk's installation instruction for the company's SuperVent 2100 cited below. 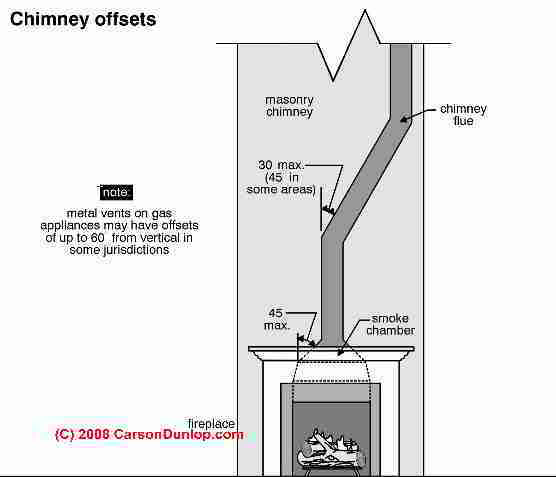 We too found some sources warning that a 45° or 30° metal chimney might be out of compliance with UL 103 and may presented increased risk of chimney fire, particularly where soot or debris can accumulate in a hard-to-access sloping chimney section. But installations to both 45° or 30° angles off from vertical (not from horizontal) are described by both standards and manufacturers. If you going to proceed you should nevertheless review your installation plan with your local fire inspector. To be clear, we are discussing a metal chimney installation, for an oil fired heating furnace, not a flue-vent connector or "stackpipe" - the term we use to describe the metal connector between the heating appliance and the actual chimney. You would not run an uninsulated flue vent connector through an attic. A flue vent connector must slope at least 1/4" per foot of run. The heater manufacturer may have other specifications and limitations on flue vent connector length. We discuss flue vent connectors separately at FLUE VENT CONNECTORS, HEATING EQUIPMENT. A 30° metal chimney is when that angle is offset from vertical, closer to vertical than 45. Both can be acceptable provided you follow both the manufacturer's installation instructions and your local building code requirements. You'll see from an example we give below that depending on where you live there may be different constraints on permissible chimney slope, elbows, and non-vertical length. You will also see that 15° offsets are described by various manufacturers. Here is a typical insulated metal chimney installation guide from a manufacturer. One pair of (two) 15° or 30° elbows may be used in an interior installation to provide an offset in order to avoid cutting of joists and to clear other obstructions. The maximum permissible angle with solid fuel installation is 30 degrees. 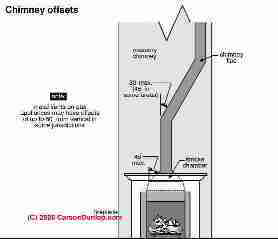 The vertical run of chimney above an offset must be supported with an elbow support. Each elbow support will support 15 ft. (4.5 m) of chimney and the maximum length of chimney allowed between the elbows is 6' (2m). Refer to the Offset Chart 1 on page 13 in these instructions for more details. Elbow kits contains 2 Elbows, 4 Locking Bands and an Elbow Support. 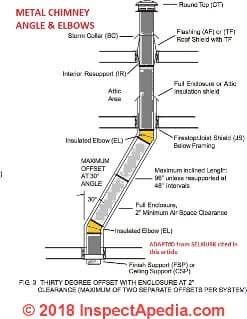 - source: SUPER VENT 2100 & SUPER PRO 2100 INSTALLATION INSTRUCTIONS & MAINTENANCE GUIDE [PDF] retrieved 2018/02/12, original source: http://www.selkirkcorp.ca/~/media/selkirk/reference-documents/common/file/installation/chimney/superpro-2100-alt/2100-installation-instructions.pdf and cited in more detail below. Here is a typical chimney or flue-vent connector slope (or pitch) guideline from a U.S. state code. There you will see that although the manufacturer may permit slopes of less than 45° a particular state guideline might not. Pitch and length. Chimney or vent connectors shall have no more than two 45° offsets with the vertical. The horizontal length shall not exceed 75% of the total vertical height of the total venting system measured from the appliance outlet. Chimney or vent connectors shall be pitched at least 1/4-inch per foot from the appliance outlet collar vent to the chimney inlet. - source: U.S. state of Wisconsin, SPS 323.15 - Chimney connectors, smoke pipes and stovepipes. found in Wisconsin SPS-323, HEATING, VENTILATING AND AIR CONDITIONING [PDF] cited in detail below. This category covers chimney and vent connectors and accessories which are engineered systems intended for connecting appliances to a vertical chimney or vent, or to reduce the clearances from connectors to combustible material in accordance with ANSI/NFPA 211, "Chimneys, Fireplaces, Vents and Solid Fuel-Burning Appliances," and ANSI/NFPA 54, "National Fuel Gas Code," or applicable local building code requirements. Continue reading at CHIMNEY LEANING, SEPARATION, MOVEMENT or select a topic from closely-related articles below, or see our complete INDEX to RELATED ARTICLES below. 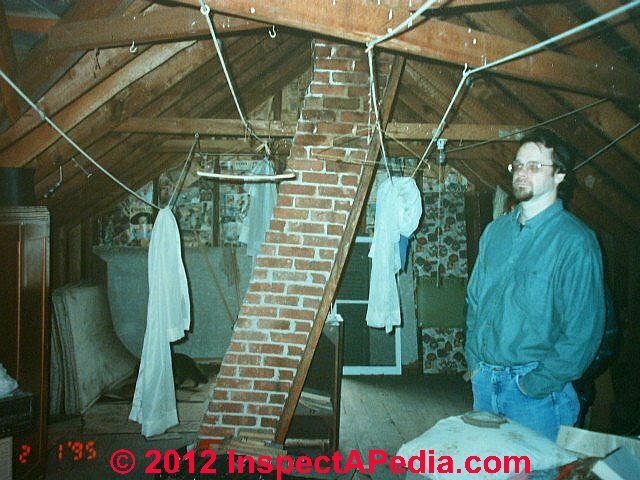 ANGLED CHIMNEYS at InspectApedia.com - online encyclopedia of building & environmental inspection, testing, diagnosis, repair, & problem prevention advice. What was the purpose of the sloped Colonial chimney. I was told that it was sloped to prevent rain from putting out the fire. Is this true? Colonial masons often brought a more central chimney straight up into the attic floor then built the chimney on an angle specifically to cause it to exit the roof at the roof's highest point - the ridge. The reasons for that decision were both cosmetic or aesthetic and possibly for improved fire safety and in some conditions improved draft too. Rain falling into a chimney can cause ugly creosote runs and drips into the fireplace - an event addressed by a chimney cap, not by a sloped flue. Question: insulate the clean out door? I have a fireplace with a chimney that slopes about thirty degrees above the damper towards the outer wall of the chimney, leaving it very difficult to clean debris above the damper. This space is about four feet from my chimney flue. Now I have installed a ceanout door on the outside of the chimney, twelve by twelve. My gflue is eleven by eleven. I put fire brick on the wall where part of the flueliner was broken out. Now my question, do I need to insulate the clean out door somehow? Chimney cleanout doors are not normally insulated - and I'd be worried lest someone try doing so, especially if they applied a combustible material. But you do want to be sure the door closes tightly so as not to subvert the chimney draft.